TRI-PLE Challenge - indoor triathlon for kids! TRI-PLE CHALLENGE Indoor Kids Triathlon! I was surprised the other day when I was informed of my dad's interest to crew for RAAM this year...well, not really surprised but surprised. To have someone so eager to share in this adventure is exciting. Well, dad came up with mom to our oldest boy's band concert and we had a RAAM strategy meeting and he was glad to take some burdens off of my back. Family - I suppose some can say that family is not all that easy (we have all been there) but when the chips are down / the motive is lost - that's when you are suprised by family when they once again swoop in and hold you close then encourage you forward. That's my dad. So for those that desire to be part of an adventure that is like no other - come on in and join the group of those that support the chance to give kids dreams they can believe in at Camp Odayin. Enjoy the weekend all and maybe see you on the road. I had the chance to enjoy a cup of chili from Potbelly's and then settled in for some inspiration on RAAM. I cued up this video - promotional on youtube for RAAM 08. What I saw was the neat side / painful side and inspiring side of this...and I am sure my thoughts don't even come close to what actually goes on. With that I say there are some really great moments caught on film about racers and crew and how this type of event - racing or crewing - will change your life. Change you can believe in...Team Strong Heart makes change and cashes in. One thing I have been told from the beginning - "you will have rings of fire to jump through all the way to Maryland." That is true and with each trial or ring - you become more aware, you bank on the success of overcoming that obstacle and THEN....when the dust settles you are able to be proactive instead of reactive. The latest change came in a big way - it was a racer change. This is not the best "change" to make with 3 months to go but we were ready to make that change if need be. So with great pleasure, I am honored to be able to ride with Tim Case and the crew this year on 4-person RAAM. Our line-up is as such - Andy-MN, Tim Case-CO, Steve Dahlke-MN and Brett Walker-NH. I am not placing them in any specific order at all - because as a team we are on a level playing field. Our talents may be varied but our hearts are in this 100%. So - for those that don't know us all that much - I will introduce you to the 09 team. Me - Andy. First time RAAM guy and the past years have brought me through many trials to get to this point and I am very excited to be here. 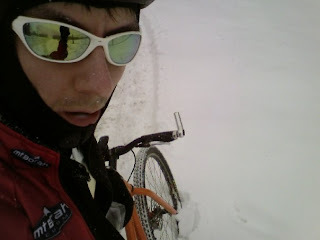 I live in Dayton MN and ride out of Trailhead Cycle with the prior TSH teams. 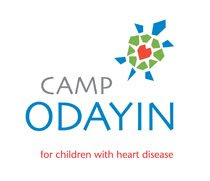 This race means more to me than I thought due to having a heart defect when I was born that corrected itself by age two - I can relate in a small way to Camp Odayin b/c of this my parents are so excited that I have a chance to pay it forward for the kids at Camp Odayin. Though my heart condition is totally resolved - I still think at times that I would have benefited from a place like Camp Odayin - and guess what...I do benefit from Camp Odayin today b/c of the gift they bring to the great and crazy kids that step foot on their grounds. This race is for you Camp Odayin! Tim is no stranger to RAAM and especially TSH. He completed RAAM 07 in the 4 man team and then the remarkable solo event in 2008 - overcoming many many obstacles along the way. He is the new addition to the race team this year and we are pretty pumped. He has the heart of a lion and is the self-proclaimed Warhead on Wheels. Living in Colorado and saving lives for a living - he has also the compassion needed to persevere through the rough times that will come. We will all lean on his experience and respond when he cracks the whip. Tim is on task and not taking this role as a casual one - we are in it to win it and most importantly leave it all on the road. Don't pick a fight with this guy - he will not back down. Perfect for RAAM. He often talks about how much Camp Odayin means to him and this side of Tim is most admirable. Glad to have you back Home Skillet. We know Steve as Snack Food Steve... long story but a good one. Steve is the sleeping giant of Trailhead. He knows what to do and honestly is the most level headed of the group (my opinion). Down to earth, solid and doesn't know when to give up - so he doesn't. 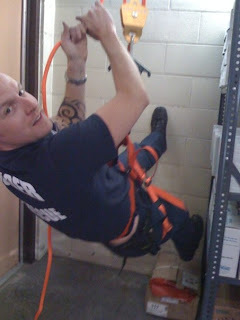 Ask anyone - Steve has an uncanny ability to just push you with a smile and a nod. Steve has taken this RAAM 09 as serious as anyone and I have had the great pleasure to know him and ride with him consistently - a true companion on the road and off. He will surprise you and did I mention he wont give into the word quit? Brett Walker - from New Hampshire. Our friend from afar. Many don't know Brett at all but I have had the great pleasure to get to know him a bit over the past few months. Don't let the fact that he is in the financial world fool you into believing he lives in the office - his passion is the open road for hours and hours - in fact he is an accomplished RAAM soloist (07) and MULTIPLE 12 and 24 hour racer throughout the year - nationwide. His most noteworthy accomplishment is when he beat the Amish gal up a hill in Pennsylvania in 07 RAAM...LOL. That pic is funny and Brett - you are a welcome addition to the team. His motto is simple - at the start line he states " this is my race to loose." Kind, funny and focused and realistic. I will accept your counsel as gospel. So that is about it - we are moving forward to June and still need your help. We have overcome so much this year already but as a community we can come together on this - despite the times at hand. We want this community - that stretches from Colorado to New Hampshire - to reach deep to support our cause. Camp Odayin deserves all our efforts both on the bike and off. Will you answer the call? See you on the road and look for updates. If you are looking for ways to help - be it CREWING for RAAM, Donations for TSH, Raffle tickets, Vehicle donations or assistance - we are all game.